ORCHARD LAKE DAM - The trail starts at the Orchard Lake Dam. This is a crucial area to the maintenance of the camp and must be treated with respect. The sheer drop from the dam as well as the machinery makes it a dangerous and interesting place. The old stone dam and its machinery controls the level of water in the lake and is regulated by the maintenance staff to insure adequate water for swimming and boating, as well as the draining off of top water from time to time to keep the lake clean. This becomes quite difficult in late summer due to little rain, and must be carefully controlled. INTO THE WOODS - Continue on the old camp entrance road for ½ mile until you almost intersect Onteora Road. Here the trail goes off to the right and up through the woods. LAKE UNCAS - In about ½ mile you will be in sight of the road to Camp Acadia. You do not cross the road, instead you go back into the woods. Soon the trail passes the general area of Lake Uncas on the left. This is a private lake and the site of a Catholic camp. You are on the border of Onteora property so do not trespass! ROCKY LEDGES - The trail continues up Rattle Hill through a series of rock cliffs and ledges. LOGGING ROAD - You will cross a logging road that was made in the winter of 1977-78. You now intersect the Orange Trail. To the right heads back to Covey Hiking Shelter. HILL - It then emerges at the top of Rattle Hill (elevation 2400 feet) with a leanto In front of you. This is where the Orange Trail branches out to the caves ahead of you and the intersection of the Blue Trail. Here the White Trail turns left on the Old Hunters Road with the Blue Trail. It follows the road 1/8 mile down Rattle Hill and turns right Into the woods towards our other outpost leanto. 1998 update: All that's left of the leanto is a small pile of broken boards and pieces of partially melted asphalt shingles. It evidently collapsed or was destroyed in a fire. NEW LEANTO - The trail passes this leanto on the right and continues off through the woods to an old logging road. Around this general area you are actually going over the East Delaware Aqueduct. LOGGING ROAD - Here the trail turns left until it joins a major logging road. It turns right on this road and follows it in a wide arc until it joins the Alder Lake Trail. Along the logging road you can see Tom Quicks Quarry, many deer tracks and a number of interesting views. ALDER LAKE TRAIL - The White Trail ends at the Alder Lake Trail and follows it back to camp. Soon there will no longer be White Trail markers, only the Alder Lake Trail markers (2/3 white on top of 1/3 red). STEEP DECLINE - You will notice that the trail becomes quite rocky. You will have a steep decline from 2800 to 2400 feet. You will be going slightly downhill and on level ground for some distance. Around this area you are actually going over the East Delaware Aqueduct for a second time. The trail goes uphill at a slight incline for a short while and then down again for a short while. LOADING SKID - Then the trail widens into what was once an old logging road. On the left you will see the remains of what once was a very old logging skid. It is very easy to pass this unless you are looking carefully for it. The logs were rolled up to one end and a truck pulled to the high end - the log was rolled onto the truck. At this point continue on the old logging road for a short distance and the road narrows again through the woods on level ground. OLD LOGGERS PUMP - When you come to an Old Loggers pump on the right hand side you approach another dirt logging road and the intersection of the Yellow Trail. The Alder Lake Trail continues across the road and heads straight ahead. At this point remember to only follow the Alder Lake Trail markers. You will now see both Alder Lake and Yellow Trail markers. The Alder Lake markers will stay with the Yellow markers for about 1/10 of a mile. Then you will see only Yellow markers. Continue down the hill on the Yellow Trail. You will now follow these yellow markers all the way back to camp. HEALTH LODGE - About 1/4 of a mile from the loggers pump downhill you will find the intersection of the Red Trail. Make a left turn and then, after a short distance, another left turn right to the Health Lodge. BRING THE FOLLOWING WITH YOU: Flashlights, long pants and thick rope. PLEASE NOTE: Alternate Trails to Rattle Hill  Blue Trail and White trail. POINTS OF INTEREST: Covey Shelter, logging road, White Trail, Rattle Hill, intersection of Blue trail, rock formations, smaller caves, larger cave. BEGINS - from the field across from Covey Shelter take the logging road at the far left corner uphill, This logging road was built in the winter of 1977-78. At the beginning you will detour the logging road for a while through the woods because of the danger of the nearby Rifle Range. Continuing up the logging road for about 3/5 of a mile you will come to the intersection of the White Trail. Here the Orange Trail turns right off into the woods with the White Trail until it hits Rattle Hill. RATTLE HILL - It then emerges at the top of Rattle Hill (elevation 2400 feet) with a leanto in front of you. This is where the White trail branches off to the left and is the intersection of the Blue Trail. The Orange Trail continues straight ahead to the caves. After a while you will see a large rock formation on your left. THE TOP OF THE CLIFF - The trail turns left and you climb to the top of the cliff. Soon you will see the first smaller cave. SMALL CAVES - All other small caves you must find by yourself. This is all part of the adventure of finding caves. Most small caves are between the top and the bottom of the rock hill as you continue on the trail. ON TOP OF HILL - Continue on trail along the top of the cliff with the small cave on your right. Finally the cliff will disappear on your right. LOGGING ROAD - Soon you will come to an old logging road. Make a right and follow the road for a very short distance. Then turn left and head up onto another rock hill. LARGER CAVE - After climbing up, you will come to the larger cave. The Orange Trail ends at the cave. The entrance is overhanging a steep ledge, so be extremely careful, This is where you should use your rope. You will probably not believe the entrance to the cave. It is a very thin decline which you have to very carefully squeeze through for a short distance. On the bottom turn left and you will enter the cave (a long hallway type cave). There parts where can actually stand. About 30 people can fit in the cave at one time. (Remember: bring your flashlight!) After carefully getting out of the cave, head back to camp along the Orange Trail the same way you came back towards Rattle Hill and finally camp. NOTE: This hike requires adult/camp staff leadership. The Blue Trail can be taken to Beaverkill or Lew Beach. The trail divides at Beaverkill Road making a left to Beaverkill and a right to Lew Beach. BEGINS - from the Council House past Sitting Bull Campsite the trail goes up Rattle Hill on Old Hunter Road. RATTLE HILL - At the top of Rattle Hill (elevation 2400 feet) there is a leanto off to the right. This is the intersection of the Orange trail to the caves and the White Trail. TOM QUICK S POND - Continue straight ahead on Old Hunters Road for about 1 mile from the top of Rattle Hill. You will see Torn Quick's Pond on your left. This was constructed by Tom Quick, the man who logged most of the country around here and has been of great assistance in originally blazing many of our trails. You are still on camp property. Just be careful of the dam because it is broken. 2001 update: There is a dispute over the use of the trail past this point. Until the owner of the surrounding land and the State work it out, hikers are advised to use the new State trail towards Frick Pond and then on to Alder Lake. BEAVERKILL ROAD - Further down Old Hunter Road it comes out on a paved road which runs left to Beaverkill Campsite, and right to Lew Beach. ARTESIAN WELL - At the end of Old Hunter Road, go left on Beaverkill Road. If you follow the Beaverkill Road for about 100 yards, then turn right through the woods, you will come out in a large meadow. In this meadow you will see a large pipe about 6 feet high. This is an artesian well and the water is good for drinking. 1998 update: The once well defined meadow is now tough to spot. A former rock quarry, the site is full of weed-covered rocks. There was no sight of the artesian well. COVERED BRIDGE - Finally, Beaverkill Road forks at a sign indicating Beaverkill State Park, with Beaverkill Road going to the left and the campground road going to the right. Continue down road for about 1/4 of a mile over covered bridge to campsite. POINTS OF INTEREST: Health Lodge, side hike to Devils Gorge and Wildcat Falls, Loggers Pump, Logging Road, rock formations, East Delaware Aqueduct, Jeep Trail, streams, Old Loggers Camp, Corduroy Road, Frick Pond, Cub Scout Camp of Beech Mountain Scout Camp (Hudson-Delaware Council), Mongaup Pond State Park side hike, Mongaup Creek Waterfalls side hike, Catskill State Fish Hatchery, Old Hunter Road, Old Cemetery, OSR Parking Lot. BEGINS - From the back of the Health Lodge, you follow the major trail off to the left. Continue down the trail (marked with yellow and red markers) just for a few yards and then you go off into the woods on the right. You will again see markers on trees indicating that this is both the Yellow and Red Trails. From here on be careful to follow only the yellow markers. The trail forks ahead, the Yellow going to the right and the Red continuing straight ahead. (side hike to Wildcat Falls) Take the Red Trail. UP THE HILL - Continue straight up the mountain. About 1/5 of a mile up the mountain the Alder Lake Trail markers will begin (2/3 white on top with 1/3 red on bottom). Ignore the Alder Lake markers, only follow the Yellow Trail. Soon you will come to a dirt logging road. Be careful to follow only the Yellow Trail markers because the Alder Lake Trail splits here. At this point you can see an old loggers pump. Make a right onto the dirt logging road. LOGGING ROADS - Continue up the Logging Road at a very slight incline and then on level ground for about 1/5 of a mile. Here the Logging Road splits. Take the left fork and turn left onto a not-as-wide logging road. The road is very rocky on basically level ground. Soon the road will become less rocky and get even much thinner with ferns on both sides. Continue up a very slight incline over a few logs and watch out for a tricky turn off to the right into the woods. ROCKY LEDGES - After turning to the right from the logging road, you go off into the woods uphill and after a short while you will approach a large rock outcrop. The trail continues up the rocks. This is a famous rest stop for many troops. Continuing up the mountain you are entering an area with many very large rocks and are almost two miles out of central camp. This stretch of the woods is very unusual because when a strong wind blows through the trees and rocks, the grating of trees together creates weird noises and gives rise to many legends about a haunted forest. THICK FOREST - You will head through a very thick forest making many circling turns. You will be on almost level ground at a slight incline. You may still hear the weird noises if it is windy out. DOWNHILL - Very soon you will be on top of the mountain and will start heading downhill. Here the forest has thinned out somewhat. Continuing down the mountain, at times getting slightly steep, there will be a tricky turn off to the left. SMALL INCLINE - Following the trail bearing to the left you come upon a small incline, but very shortly the trail will start heading down again making many turns through the woods. Be very careful that at all times you are following Yellow Trail markers. About this time you have left Onteora Scout Reservation and entered Beech Mountain Scout Camp property. Soon you will come to another logging road. 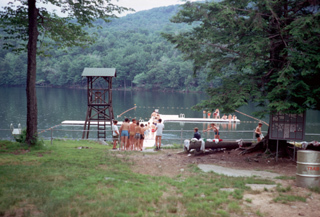 1969: The waterfront at Beech Mountain looked very much like the Onteora docks. 1998 update: Sadly, Beech Mountain Scout Camp is no longer with us, having closed several years ago. The site is now a New York State public campground and hiking area. JEEP TRAIL - The trail comes out of the woods on another logging road, turns left, follows the road for a while and then bears right onto a jeep trail. You have actually just walked over the East Delaware Aqueduct. Continue on this road for a short distance downhill being very careful to notice double markers signaling the Yellow Trail cutting off into the woods on the right. The jeep trail continues to Hodge Pond (Beech Mountain Scout Camp). DRY DEEP STREAM BED - After turning off into the woods on the right (almost making a complete U-turn), you head slightly down hill and approach a very deep dry stream bed. Make a left and then bear right within the stream bed. OLD LOGGERS EQUIPMENT - Very soon the trail heads into the woods again crossing dry streams and other loggers roads. You will notice an old loggers stove and other such equipment. After crossing one stream which usually has slow moving water, the trail bends all the way to the left and then along the stream. LOGGING CAMP AND CORDUROY ROAD - You then come upon a Corduroy Road. You are now in the general area of an old logging camp with remains of buildings and other equipment. Turn right onto the Corduroy Road. This old road was built over a hundred years ago to haul the logs through the swampy lands. There are many old log planks left that form the shape of railroad tracks. Continue on the road mile until you see Frick Pond on your left. SMALL MEADOW - You enter a very small meadow. Face towards the pond and then the trail heads off to the right thru thick blueberry bushes along the side of the pond to the front of Frick Pond at the beaver dam. BEECH MOUNTAIN ENTRANCE - From the trail make a right at the beaver dam and small water tank. Head up the camp road away from the pond of a mile to the camp entrance, On the right along the road is a tombstone where two children were buried in 1933. DEBRUCE ROAD - Make a tight at the camp entrance onto DeBruce Road. Continue down the road towards the Fish Hatchery. Eight hundred feet from the camp entrance you go over the East Delaware Aqueduct for the second time. MONGAUP POND PUBLIC CAMPSITE (SIDE HIKE) - Thirteen hundred feet from the camp entrance you will come to a 4-way intersection with the road to Mongaup Pond on your left. This leads to Mongaup Pond (1.5 miles), The swimming area is just past the entrance where there is also drinking water and rest rooms. Also many troops eat lunch here. MONGAUP CREEK WATERFALLS (SIDE HIKE) - Also at this 4-way intersection of the Mongaup Park Road and DeBruce Road is a dirt road straight in front of you which leads to the waterfalls. Follow it over the bridge and then follow the stream to the right downstream to the waterfalls. These are not only interesting but many troops use them for showers or eat lunch at the falls. CONTINUATION OF YELLOW TRAIL - At this same intersection, going down the road from Beech Mountain Scout camp, make a right and continue downhill for 4/5 mile to the fish Hatchery. NEW YORK STATE CATSKILL FISH HATCHERY -The large building on the left is the New York State Fish Hatchery. The entrance is just past the building. Here 1/2 million trout are raised under controlled conditions to stock the rivers and streams of the Catskills. Scouts are asked to be, at all times, good Scouts and not disturb or touch the fish or any equipment as this would upset their controlled breeding process. The Scouts could also feed the fish for 10 cents. An artesian well is used to pump the water into the Hatchery. OLD HUNTER ROAD - Two hundred feet south of the Fish Hatchery on DeBruce Road is Old Hunter Road; turn right and continue up the mountain. This part of the trail is part of the Old Hunter Road which was built in 1815 by John Hunter and opened the area to settlement. OLD CEMETERY - Proceeding 3/10 mile up the steep climb there appears on the left an old cemetery. The oldest stone is dated 1885. It is interesting to note the epitaphs carved on some of the older stones. FROG HOLLOW ROAD AND GUN CLUB LODGE - On the left will be the hunting lodge for the Frog Hollow Road and Gun Club. DOWNHILL - The Old Hunter Road proceeds downhill 2 and 3/10 miles from the Fish Hatchery, and continues downhill all the way to Onteora. INTO THE WOODS - Half mile from the top of the mountain the Old Hunters Road turns left. At this point continue straight onto a trail which, in 3/10 mile, takes you into the OSR parking lot. POINTS OF INTEREST; Health Lodge, Wildcat Falls, Devils Gorge, Al Nassau Area, Catholic Chapel, both shower houses, Council House, Covey Hiking Shelter, Dan Beard Shelter, Long House, Teddy Roosevelt Shelter, Orchard, O.S.R .road, O.S.R. parking lot. This trail is all within the main operating area of the reservation. It is designed as a beginners hike and to familiarize anyone taking it with the major facilities necessary to a persons stay at Onteora as well as with some of the camp history and background. The trail is a good beginners hike because the Scout does experience many different hiking situations. The trail travels on camp roads, follows logging roads, goes through wooded areas, crosses streams, visits otherwise non-visited camp areas, passes a falls, and climbs up a ravine. START - From the back of the Health Lodge you follow the major trail off to the left. Continue down the trail (marked with red and yellow markers) just for a few yards and then you go off into the woods on the right. You will again see markers on trees indicating that this is both the yellow and Red Trails. From here on be careful to follow only the red markers. The trail forks the Yellow going to the right end the Red continuing straight ahead. WILDCAT FALLS - The trail comes out into a fairly open area across a rocky stream bed with high rock lodges off to your right. This is Wildcat Falls. In the summer most times only a trickle of water comes down over these ledges, but in the spring when the snow is melting this is a spectacular and beautiful falls. As you face the falls a ledge and crevice will be seen in the right hand wall of the cliff. This crevice has been used as a porcupine den for years as evidenced by the many droppings. DEVILS GORGE - The trail continues through the woods to the right of the stream, then swings left (north) down into and up out of Devils Gorge. This deep ravine has been primarily caused by erosion of the spring snow melt off. It was named early in the development of the camp when the Explorer Base Camp was up in that area and for four years, from 1957 on, it was crossed by a monkey bridge. TRAIL SPLITS - After coming up out of the gorge you come to the old "Base Camp Road". Here you have a choice! The Red Trail splits - to the right is the old Red Trail and to the left is the newer short cut. THE SHORT CUT - The short cut takes you through Nils Fairbairn Campsite to Marshall Lesser Campsite. THE OLD RED TRAIL - The old Red Trail turns right on the old "Base Camp Road". The trail next makes a sharp left turn just before an old dilapidated wooden bridge. (Do not cross the bridge or you will be off the trail.) From here the trail continues in a long arch, first North then West through the forest, the first part of which was logged off during the winter of 1965. In the last stretch of the road the trail goes downhill until it comes out into a large field which was designated to become the center of the third division of Onteora. The road continues along the South side of the field and becomes a well worn dirt road as it leaves the field in its Southwest corner. 1998 update: One well-worn board studded with nails is all that remains of the wooden bridge. The "large field" mentioned above is covered with face-high growth - a real treat to cross! 1998 update: The chapels are no longer there, having been moved behind the Health Lodge for staff housing. THROUGH THE WOODS BEHIND LITTLE CALF CAMPSITE - Follow the trail up the hill and through the woods until you come out at the shower house near the Council House. You are now at the old road to the sump (drainage beds) for the Council House. COUNCIL HOUSE - Turning right you will come out at the Council House. This is the newer of Onteoras two food service buildings, which opened for the summer of 1960. Today it is the Onteora Craft Lodge. INTO THE WOODS - As the Council House looms up in front of you, turn left and then another sharp left, and head down the camp road towards Otter Program Shelter. Very shortly, right after Tecumseh Campsite, follow a wide trail that forks off to the right. In a few feet the Red Trail cuts off this trail to the right again between Tecumseh and Adoette Campsites and then again turn left into the woods behind Adoette Campsite. DAN BEARD PROGRAM AREA - At Covey Hiking make a left onto the road that goes towards Dan Beard Program Shelter. When you reach the end this camp road turn right onto the Ute Loop. In the field on the right the foundation of a house and a root cellar was located at the downhill end of the orchard near the main road along with some blueberry bushes, which the inhabitants of the old farm house planted many years ago. The next program shelter that you will pass is the Dan Beard area. LONG HOUSE - At the Sioux Campsite the trail turns sharply left (east) into the woods and brings you out at the Long House, which was built during a big snow storm in the late fall of 1958. This food service building serves the entire camp. To the north you will see the James C. West Program Shelter (Field Sports Shelter) and the 65,000 gallon water tank which supplies the whole camp. It draws its water from the well which is located at the foot of the hill near the stream into the lake. The well is 240 feet deep and will produce 280 gallons of water a minute. When it is understood that the National Engineering Service of the Boy Scouts of America estimates that it takes 50 gallons of water a day to keep a boy in camp, it can be understood that this facility must be handled with care. ORCHARD LAKE DAM - Turning right and passing along the west side of the Long House you enter the woods on a dirt road known as the Long House Loop to the Navajo Loop. This road curves around to the east and if followed to the end, comes back along the mountain below the Long House to the Water Tank. As you hike it you pass the Teddy Roosevelt Program Area to emerge on the lake road near the once South or Tribes Waterfront. Turning right follow this road until you come to the dam at the end of the lake. This again is a crucial area to the maintenance of the camp and must be treated with respect. The sheer drop from the dam as wall as the machinery makes it a dangerous and interesting place. The old stone dam and its machinery controls the level of water in the lake and is regulated by the maintenance staff to insure adequate water for swimming and boating, as well as the draining off of top water from time to time to keep the lake clean. This becomes quite difficult in late summer, due to little rain, and must be carefully controlled. OTHER SIDE OF ORCHARD LAKE - The trail turns easterly (sharp left) below the dam and crosses the stream. From here the trail swings north and follows along the west side of the lake. This is a good wildlife area if one walks slowly, softly and quietly. Mink have been seen several times near and in the water. Soon the trail goes further into the woods towards the right and then climbs a steep incline. Finally the trail comes out onto Onteora Road. Make a left and continue down the road into the Onteora Scout Reservation Parking Lot. Click here to return to the main hiking trails page or here for the main Onteora page.